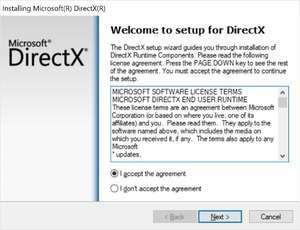 The DirectX End-User Runtime Web Installer is a collection of DirectX libraries and components required to run several graphical interfaces on Windows. The main download of DirectX, dxwebsetup.exe will download all currently available versions of DirectX and its updates including DirectX 9.0, 9. Version 9.29.1974 is a freeware program which does not have restrictions and it's free so it doesn't cost anything. For security reasons, you should also check out the DirectX End-User Runtime Web Installer download at LO4D.com which includes virus and malware tests. Additional screenshots of this application download may be available, too.